Maybe Westerns really are back in fashion. On the same weekend that 3:10 to Yuma managed to sustain its opening weekend momentum at the theatrical box-office, Broken Trail lassoed a passel of prizes, including the award for Best Miniseries, during the Emmy Awards extravaganza. 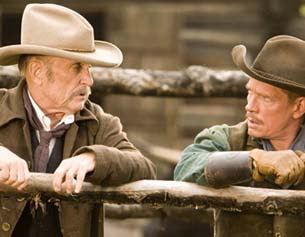 Robert Duvall was honored as Best Actor in a miniseries, and Thomas Haden Church received the Best Supporting Actor prize. But wait, there's more: Bury My Heart at Wounded Knee -- the HBO adaptation of the Dee Brown best-seller -- was honored as Best Made-for-Television Movie. Across the Universe bestrides a generation gap?